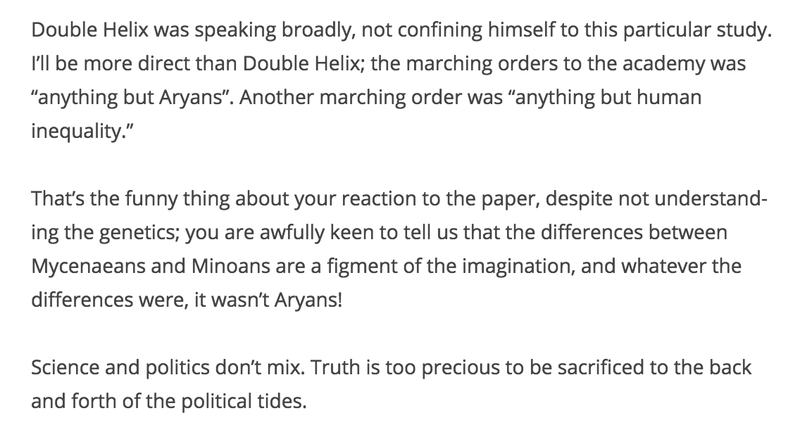 I want to begin from a couple of comments on a post on Dimitri Nakassis’ blog Aegean History. The blog post was Dimitri’s response to the recent article published in Nature on some genetics testing done of Bronze Age bodies. 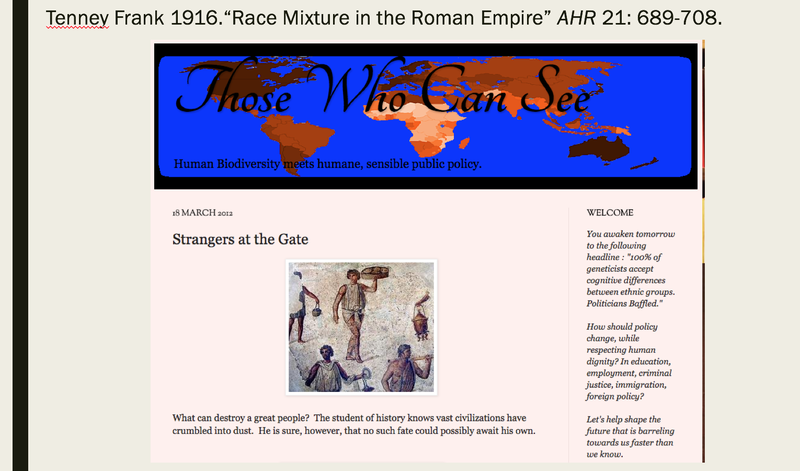 I won’t get into any of the genetics issues here and defer to Denise’s paper on the matter (now an Eidolon article), but I want to focus instead on the implications of these comments for engagement between scholars and public in any discussion about race and ethnicity in antiquity and the implications in modern race discussions. 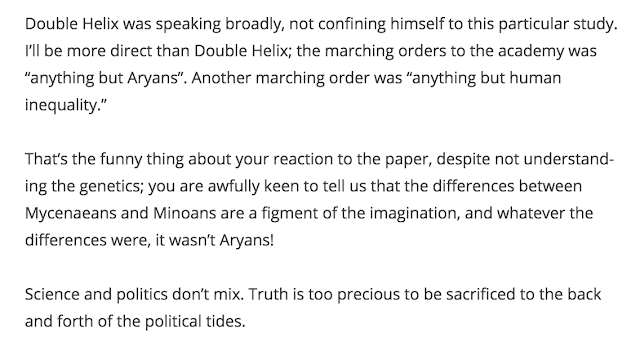 I start from these comments because I believe they sum up what is the communis opinio among white nationalist groups--that after the Holocaust, academics were told that race was not "real" and that they should not talk about it. 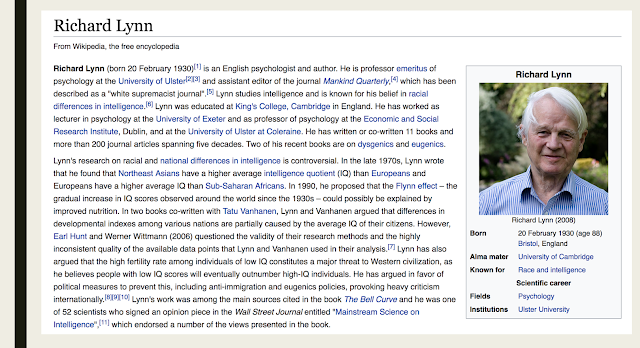 “Anything by Aryans, anything but human inequality.” The debates on how an uncritical genetics has begun to reify race science are just really starting to heat up (Dorothy Roberts’ book is a must read), as we just heard. My interest here, though, is in the way Classical scholarship gets used and filtered by white supremacists--much of which involves the wholesale rejection, ignoring, or attacking of scholarship that questions race and race hierarchies as a biological reality. The first part of my paper therefore examines the rejection of classical scholarship by white supremacists and then look at what scholarship does get cited and read by them. I’ll then consider ways we can try to get ourselves out of the bind of complicity with these habits of scholarly rejection and citation. Let’s start by acknowledging that there is something to what Double Helix and Afterthought say. 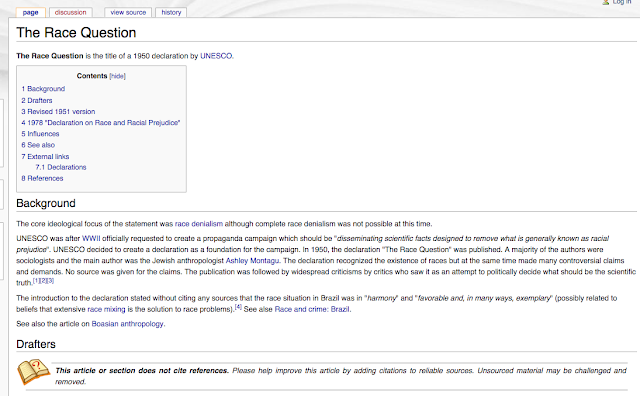 As many of you in the audience may know UNESCO was formed after World War II in 1945, in part as a response to the horrors of the Holocaust and the scientific studies and experiments that were a natural outgrowth and progression of what was acceptable race science throughout the preceding century. 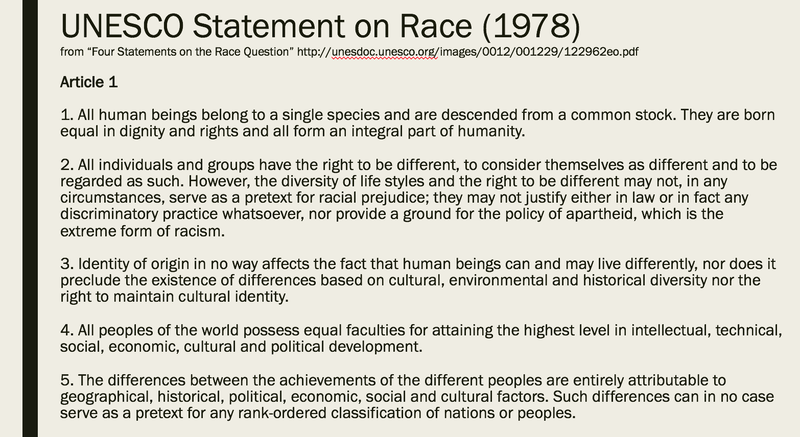 In 1949, UNESCO was asked by the UN to create a program “to make known the scientific facts about race and to combat racial prejudice.” The UNESCO “Statement on Race” was first published in 1950. 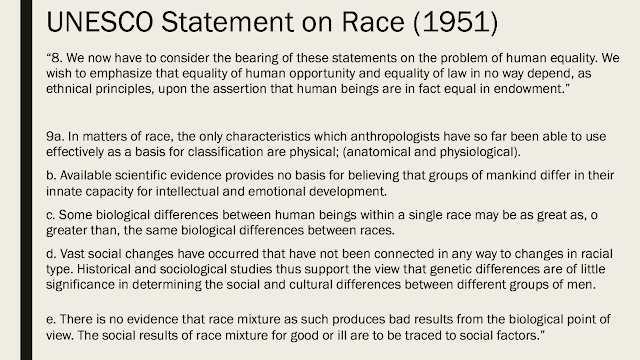 The 1950 statement was composed almost exclusively by anthropologists and sociologists. Concerns were raised almost immediately by physical anthropologists and biologists, particularly those in the developing science of genetics, that they were not represented on the initial drafting, although they DID participate in several revisions done before the statement was finally published in July of 1950. 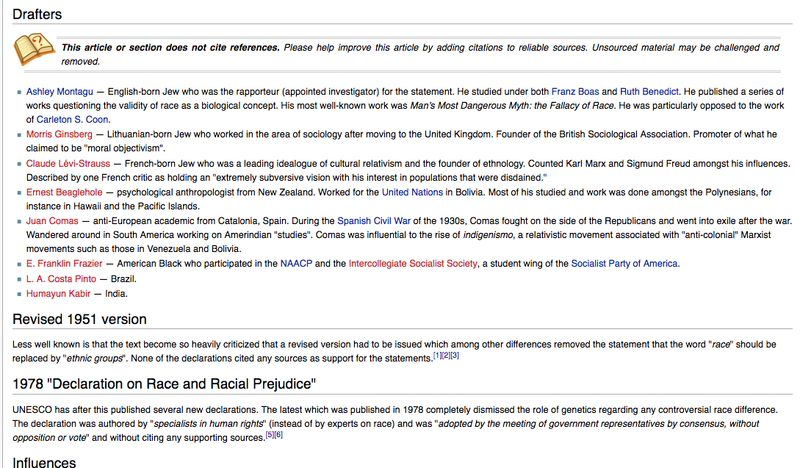 They therefore issued their own statement through UNESCO in 1951. Subsequent statements were issued again in 1964 and 1967 and again in 1978. What were those statements? Why so many? What were the differences? And how have they been received among groups whose attitude seems to be reflected in the comments of Afterthought and Double Helix? 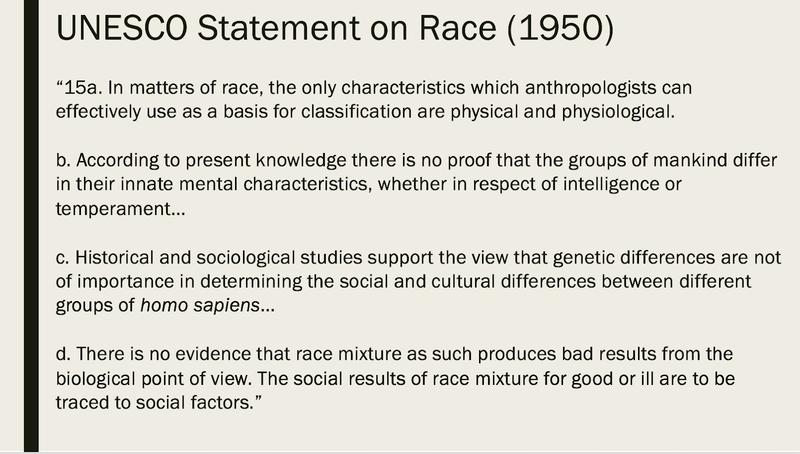 The second statement from 1951 (SLIDE 6), published by a group of physical anthropologists, biologists and geneticists generally agreed with the 1950 statement, but provided a few caveats that left open the possibility that behaviors and aptitudes could, in fact, potentially be discerned through the study of genes. 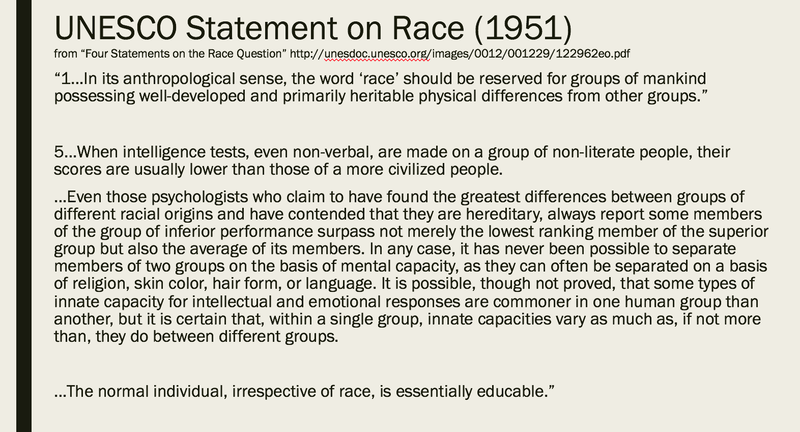 And, while the conclusions are strongly stated and concur generally with the conclusions of the 1950 statement, wording throughout the statement--including references to ‘civilized’ groups and those of ‘superior’ and ‘inferior’ intelligence, of normalilty and, that race mixing leads to race extinction--provide cover for scientific studies conducted without reference to the possible social impacts that sociologists and anthropologists were so concerned with. This debate still ongoing, if any of you have been following the Sam Harris/Ezra Kline discussions among others. 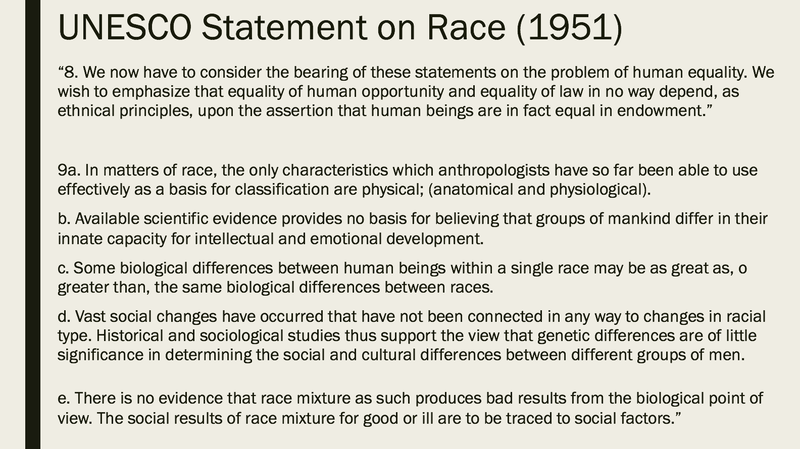 The 1964 and 1967 statements update the 1950 and 1951 statements in ways that mostly reflect what is still generally accepted today by sociologists/anthropologists and most geneticists. 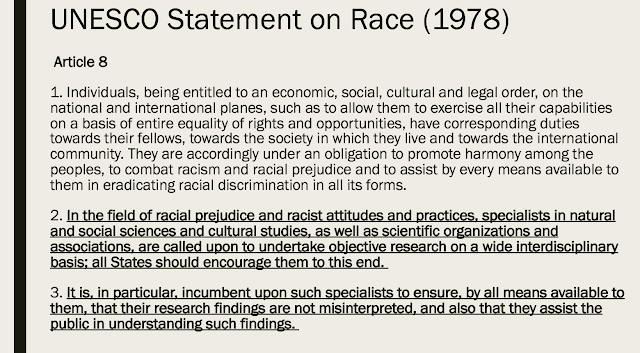 The 1978 statement comes more in the form of a list of articles of belief and includes a statement expecting scholars/scientists to make their data and information available and understandable to the public. But what if the public isn’t interested? 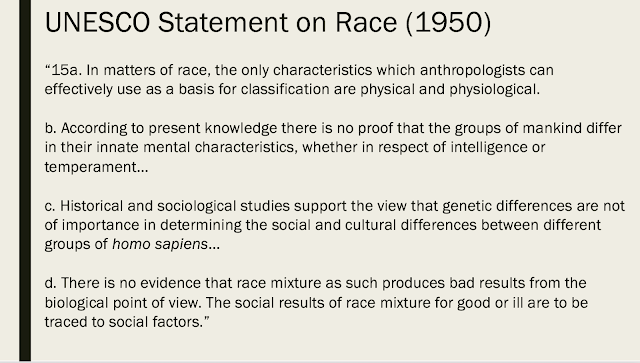 These statements and the divisions between Sociology/Anthropology views and Physical Anth/Biology/Genetics views has left open a space for dismissal by white supremacist groups, particularly as they generally ignore the 1964 and 1967 updates. 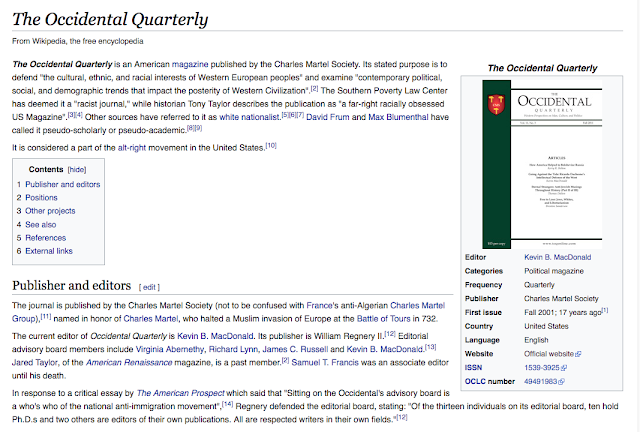 One place you can go look and see these views expressed (if you are really interested--I don’t recommend it) for how the white supremacists consider this issue is to Metapedia: The Alternative Encyclopedia. 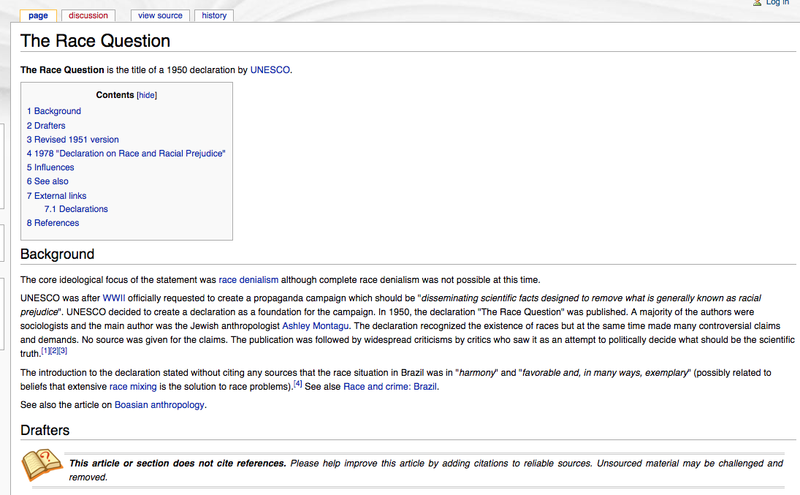 They have a page, of course, on the UNESCO statement. Let’s have a look. The page then lists the authors of the statement, making a point to mark all the Jews involved) and gives a brief summary of the 1951 supplement and the 1978 revision (the page ignores the 1964 and 1967 revisions). Note the language of this page compared to that of both the statements and the comments by Double Helix and Afterthought: The erasure of the word ‘race’ replaced with ‘ethnic groups’, the idea that these statements are ‘commands from on high’ or ‘marching orders’, the division between social science and natural science--that what social science tries to erase, natural sciences will restore. 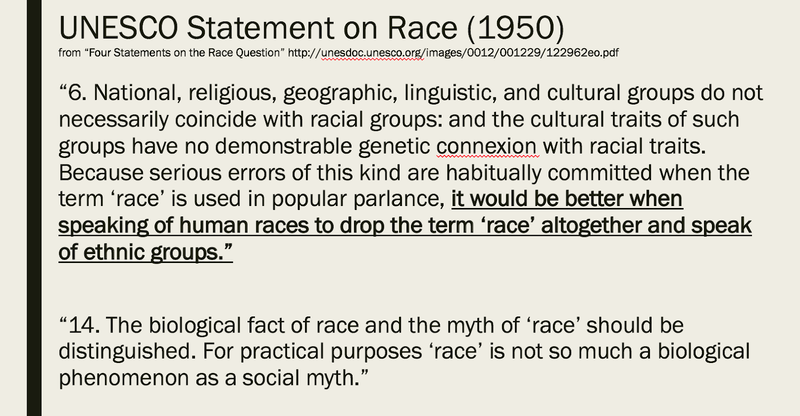 Also, of course, the 1951 statement by physical anthropologists and geneticist’s states unequivocally (in the name of combating myths of biological purity) that race extinction or absorption is a result of race mixture--something you hear discussed repeatedly on white supremacist and race-realism forums--this statement supports the idea that inter-racial marriage = race genocide. Which brings us, in fact, to the Classics. If UNESCO has issued marching orders, are we following them and what does that mean? 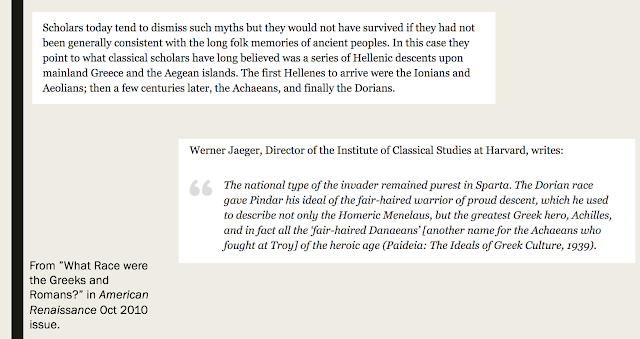 Over the course of the last 30 years, there has been something of an explosion of ‘ethnicity’ studies in Classics and ancient history. 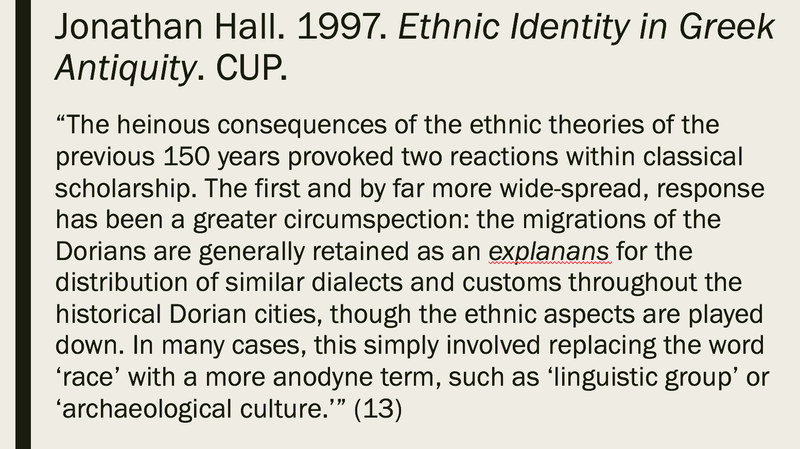 Jonathan Hall states that ‘ethnicity’ has been used since WWII as a substitute for ‘race’ as an attempt to distance such studies from the sins of pre-WWII anthropology. He himself worked to move away from this ‘replacement’ approach and views ethnicity as more “the operation of socially dynamic relationships” instead of ‘ethnic groups’ that were just ‘races’ by another name, his concept of ethnicity is far more nuanced than how you will find ‘race’ discussed as by your average internet white supremacist or even, your PhD’d internet white supremacist--but it’s fairly easy to see this as admitting that the field has followed of the “marching orders” of UNESCO. 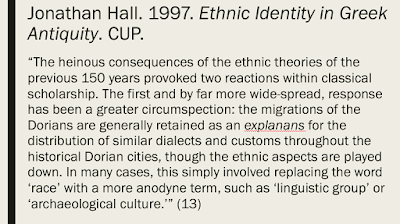 McInerney, in the end, adopts the term ethnicity for his entire volume, without ever explaining why he chooses not to use race --a reader who knows the UNESCO statement could see why, though--he has been given his ‘marching orders’ and is following them. 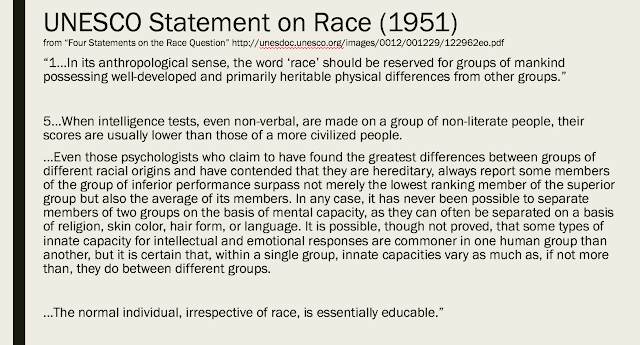 He also, of course, codes the use of 'race' as political and activist, ignoring that the decision to use 'ethnicity' was itself a political act. "In its focus on muting race and racialized explanations, U.S. anthropology has historically paid less attention to racism. 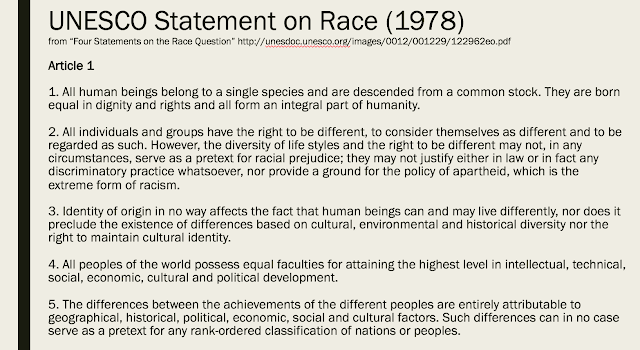 Racism was viewed as primarily an illusion about race, overlooking that structured racism itself gives importance to race. While anthropology has therefore often been used to protest structured racism, its institutional position as an anti-race science has often also insulated it from a necessary self-critique of the discipline’s own silences, exclusions, and practices around race." Editorial note, “Race, Racism, and Protesting Anthropology” Open Anthropology: A Public Journal of the American Anthropological Association 3 (3) 2015. So, this is a quick look at reasons why contemporary scholarship might get rejected in favor of older scholarship. Now for what kind of scholarship gets cited. 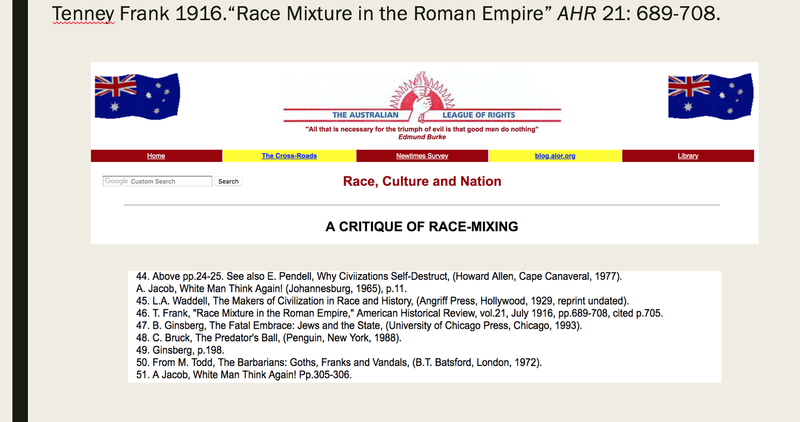 Unlike the more modern scholarship on ‘ethnic identity,’ there is one article that is repeatedly cited, reproduced, and quoted by white supremacists--Tenney Frank’s “Race Mixture in the Roman Empire” (1916). (SLIDE 17). One may ask how such an old article continues to be so popular? Well, the repeated footnote is one method--we see this in scholarship all the time, where someone just cites a source directly from another author and footnotes that author’s footnote. 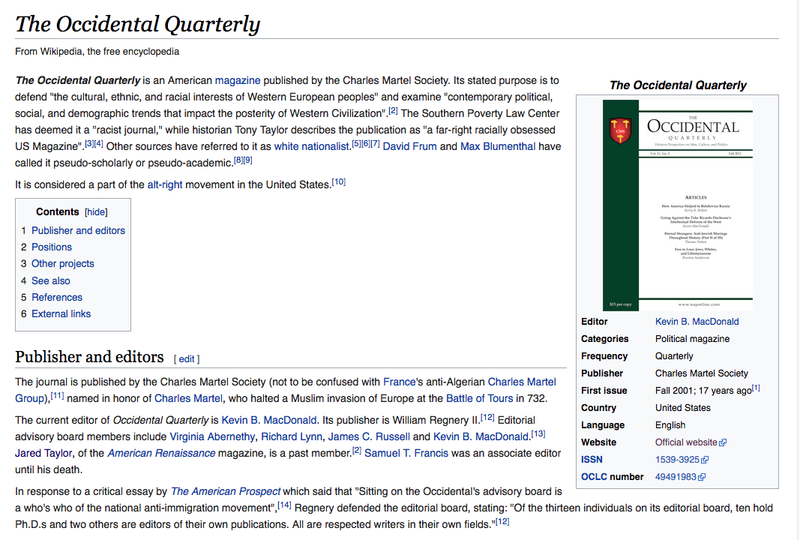 But, with Frank, the perpetuation of his arguments and their move into standard discourse of white supremacism worldwide--here’s an Australian group--- has been more than a repeated footnote. Here, again, is Frank’s article as the subject of this blog post, which moves from Frank into British immigration debate. 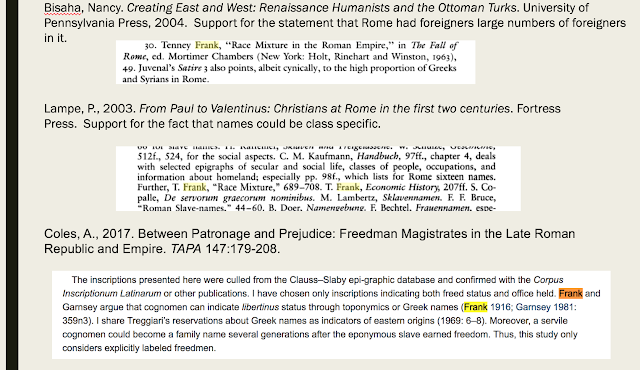 There are dozens of these direct citations to Frank on WS webpages and blogs. There are also sites, such as the FAEM that provide ‘histories’ of the white race using Frank and which provide links to ancient sources that support the view that Romans shared their view of race--Juvenal and Aristotle are, of course, fan favorites. Roger Pearson, a eugenics advocate and academic anthropologist in the UK and then US, republished Franks ideas in the 1960s in journal called “Western Destiny,” which has been reprinted in numerous WS webpages, blogs, etc. 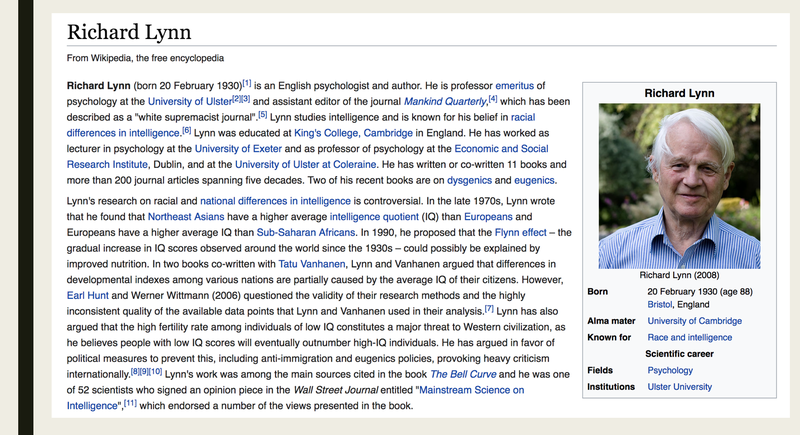 And Frank’s essay itself was republished in 2005 in the Occidental Quarterly, a favorite journal of the the far right ‘intelligensia’--with 10 PhDs on its editorial board including psychologist Richard Lynn, whose work is foundational for Charles Murray’s The Bell Curve. 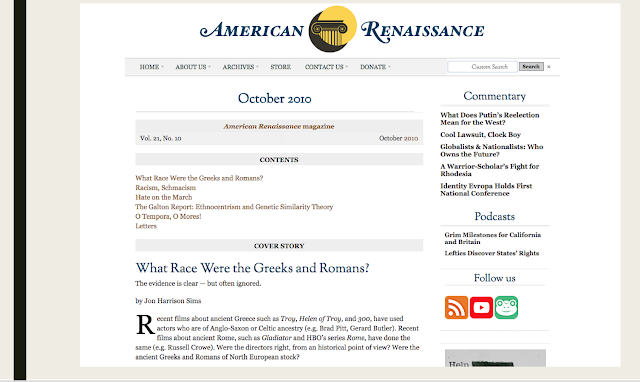 Another popular far right journal (and, like Occidental Quarterly, on the Southern Poverty Law Center’s list of white supremacist publications) is American Renaissance, whose special 2010 issue on race in antiquity has a series of articles, the first of which is focused on the hair color and “Nordic” decent of the ancient Greeks and Roman patricians--this time the rejection of post-1960s scholarship is explicit. 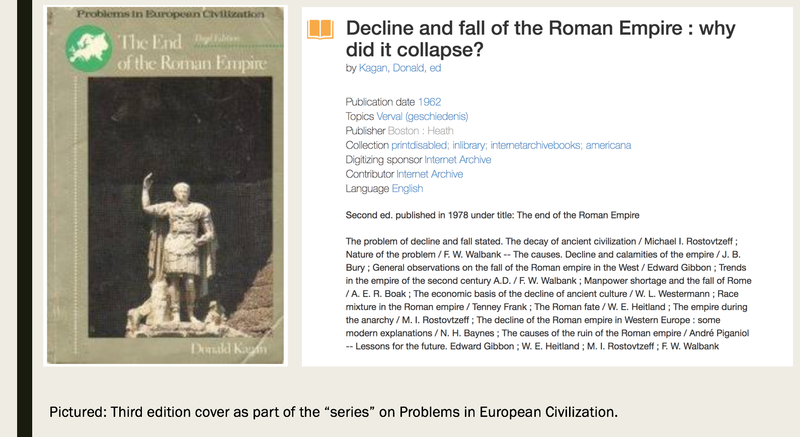 far too many of which are not critical, and to Donald Kagan and one of his textbooks, The End of the Roman Empire, published first in 1962 as Decline and Fall of the Roman Empire: Why did it collapse? and then republished in 1978 and then again in 1992 under the new title. This textbook, as part of the “Problems in European Civilization” series reproduces a whole series of pre-1960s scholarship, including Frank’s essay. The textbook, used in Western Civ courses into the 1990s did not, even in the 1990s, comment upon the clear racism of Frank’s approach. 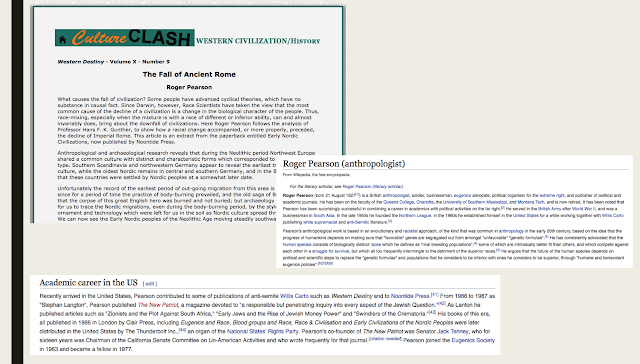 When such ideas--that race mixture destroyed the Roman Empire--are mainstreamed in courses on Western Civilization under the name of a prominent ancient historian, should we be surprised that the ideas continue to be read, cited, and perpetuated long after they should have been buried on the so-called fringes as well? 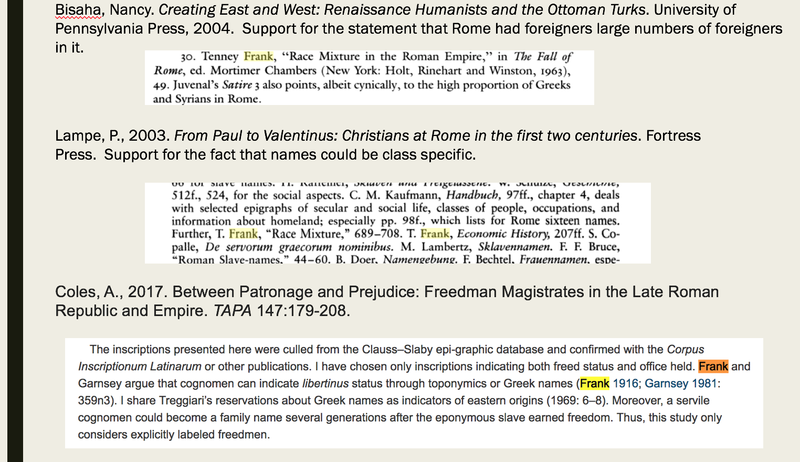 And this is where things get fuzzy--if we follow the thread of Frank’s essay, it takes us not only into the fringes of the internet and so-called race realism, but into the mainstream of the teaching of the history of the “West”. 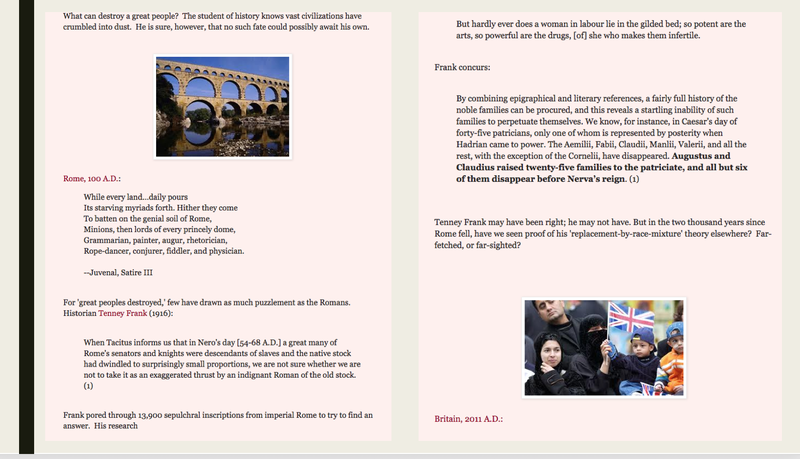 Frank’s essay has had such longevity because those who read the UNESCO Statement on race as propaganda are able to align themselves to more conservative scholars in our field, and find respectability in the continued use of clearly racist and clearly biased scholarship under the moniker of Western Civilization--Frank’s central thesis, that mass immigration and “multiculturalism” was a cause in Rome’s demise appears repeatedly in statements by public scholars; Niall Ferguson and company are only one of the latest in a long line--the entire Brexit debate is a case study. So, how can we combat this? Well, we have already started--a self-critical, self-reflective Classics is beginning to develop, one that is willing to engage its own concomitant development with imperialism, colonialism, and race science. 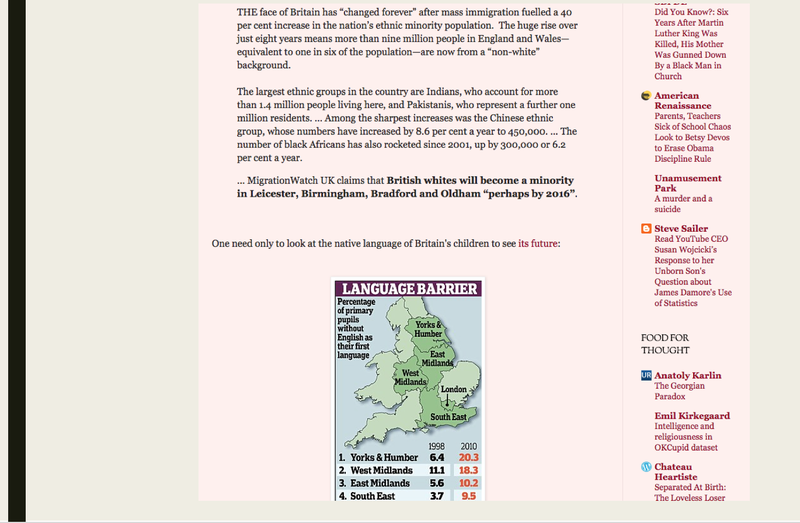 We need to understand why we use the language of ‘ethnicity’ instead of race. 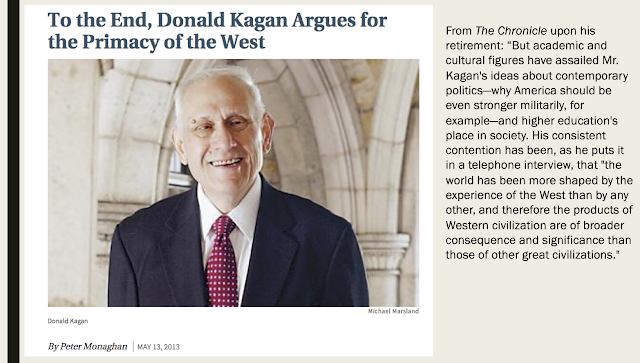 We must continue to critique the idea of “Western Civilization” as the way to ground the Classics in our college curricula. We must be open to engaging the language of race once again in scholarship, as the American Anthropological Association urges (and as scholars like Denise, Shelly Halley, and others have already been doing). Maybe we need to give up the name Classics, with its inherent valuation and become something slightly different--this debate is happening right now among dozens of departments (particularly in small Liberal Arts Colleges). We need to work as well at removing disciplinary boundaries--while we in Classics see ourselves moving the needle on discussions of ethnicity and race in antiquity, our colleagues in Political Science, Philosophy, and many History depts. are still teaching the views of earlier scholarship--they are engaged in different disciplinary approaches and some simply may not be ready to face their demons. How can we change that? How can we engage those colleagues? By writing outside of our disciplinary boundaries, by cross-listing, by attending their events, by offering ourselves up to visit their classes, what else? 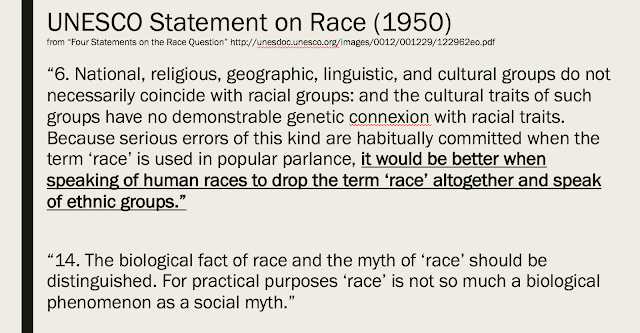 Outside of the campus, we need, I think, to stop ceding the discussion about race and classics in public fora to white supremacists, especially to those who have PhDs (almost never in classics, ancient history, or archaeology) who can give a veneer of intellectual rigor to their internet publications and musing such as I’ve highlighted above. 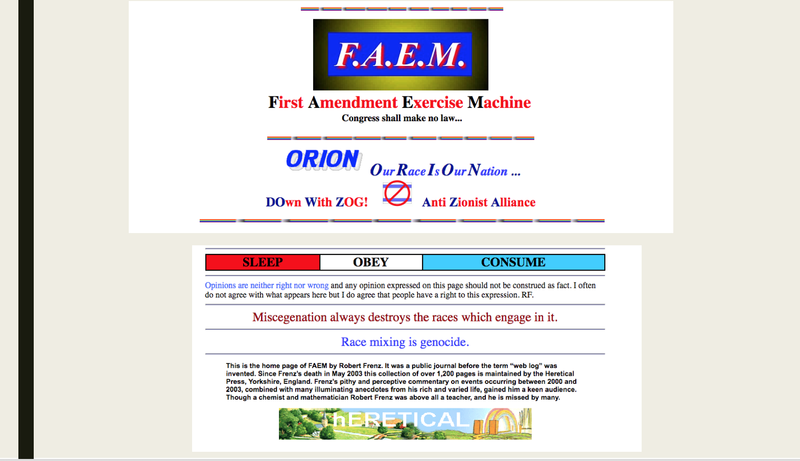 We need to figure out ways to engage more directly with the public, to persuade those who are open to persuasion, to provide information and new interpretations of old data to broader audiences, to accept the mantel of REVISIONISM as a good and necessary thing. And we need to take it to the public in as many ways and as often as we can and encourage colleagues to do so as well by counting popular publications, podcasting, media appearances etc. as actual scholarship and not as a nuisance.